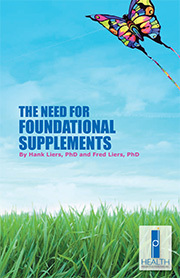 We recently added a category of products for Gut Health to the HPDI foundational supplements program. We did this not only because there is a documented increase in gut-related health issues, but also because we hear about gut health issues from our clients and resellers. They desire effective means for solving the gut health problems prevalent today. One of the biggest gut health problems we see today is leaky gut syndrome. The syndrome goes by other names and encompasses various symptoms. These symptoms broadly encompass food allergies, sensitivities, and intolerances. Yet, the symptoms can also include low energy, fatigue, immune disorders, as well as obesity and blood sugar issues. It also encompasses celiac disease and certain brain disorders. In fact, most of these gut-related conditions and symptoms today go beyond what was historically meant by “leaky gut syndrome.” Today leaky gut and the conditions associated with it largely seem to relate to a combination of factors, including modern agricultural methods, use of antibiotics and certain other pharmaceuticals, and toxic chemicals in foods and the environment. Studies show the herbicide glyphosate adversely impacts gut health. Agriculture was not so long ago an organic affair. Chemical fertilizers were unknown, soils were healthier, and crops were at least non-GMO. Things got worse with the introduction of chemical fertilizers, herbicides, and pesticides. The green revolution of the 1960s brought more changes, including the rise of monoculture crops and more dependence on chemicals. Chemicals used in agriculture destroy soil microbes. These chemicals induce plant growth without simultaneously improving the quality of the soil. Consequently, the result is depletion of nutrients in soils. This has been proven by measurable declines in vitamins, minerals, and other nutrients in food crops. When soils are continuously depleted and are nutrients are not replaced or augmented (as in Biodynamic agriculture, for example), soils have fewer nutrients. Eventually crops grown in these soils will be nutrient-poor and therefore not optimal for health. Nutrient declines in soils are significant, and soils continue to be depleted of nutrients. The combination of chemical fertilizers, herbicides, and pesticides has created an unsustainable system of agriculture that does not produce nutritious food crops. 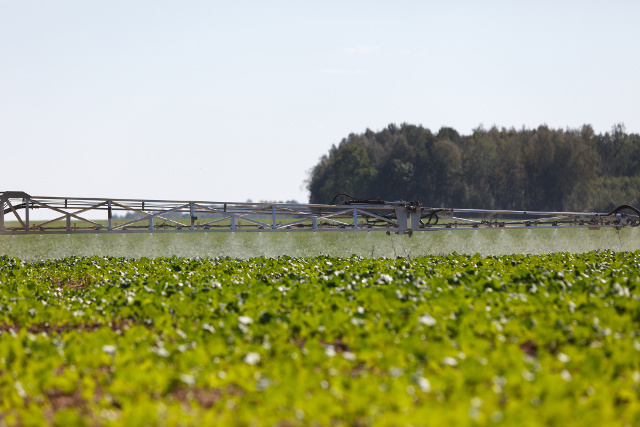 Herbicides such as 2,4-D and atrazine, and pesticides like DDT (which remains in soils) are examples of chemicals that can significantly harm human and environmental health. The introduction of genetically modified (GMO) crops has accelerated the negative effects of industrialized farming methods. This is especially true in terms of the lowering soil-quality and adversely impacting soil microbes, reducing nutrient levels in crops, and both directly and indirectly harming human health. GMO crops have not been properly tested for safety. The dangers of GMO crops are significant. 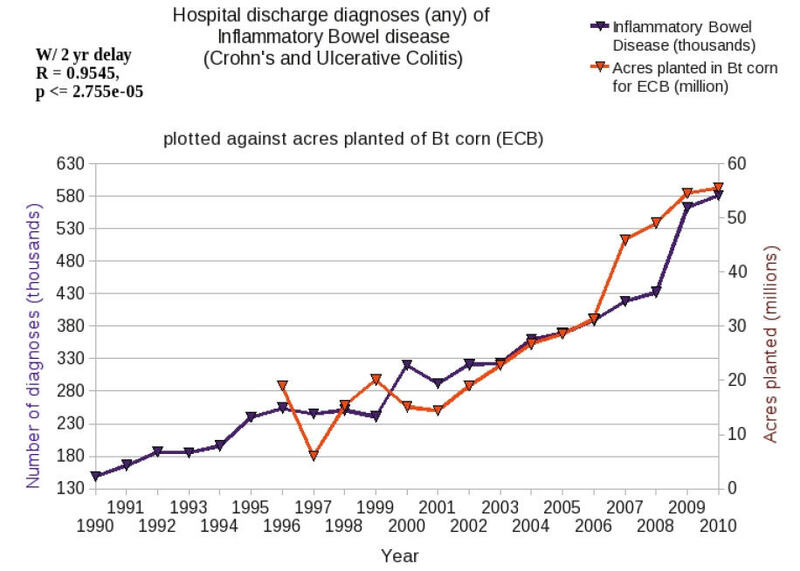 Bt corn is a crop whose genetic modification is associated directly with gut health issues (see charts below). Bt corn was created to damage the intestines of insects, but that also damages the health of the human gut. When combined with specialized herbicides designed for use on GMO crops, the dangers of GMOs increase significantly. The primary herbicide used for GMO crops is glyphosate, which is a mineral chelator, endocrine disruptor, and biocide with antibiotic effects that kill bacteria (beneficial and harmful) indiscriminately leading to an imbalanced human microbiome. Glyphosate appears to be associated with an increasing number of adverse health conditions partly because many health problems can be caused or exacerbated by nutrient deficiencies, endocrine disruption, microbiome imbalances, and other toxic effects. These health conditions include leaky gut syndrome which not only may result from an imbalanced microbiome, but also from a loosening of the necessarily tight junctions in the gut wall that protect us from exposure to foreign proteins not unlike the blood-brain barrier protects our brain. 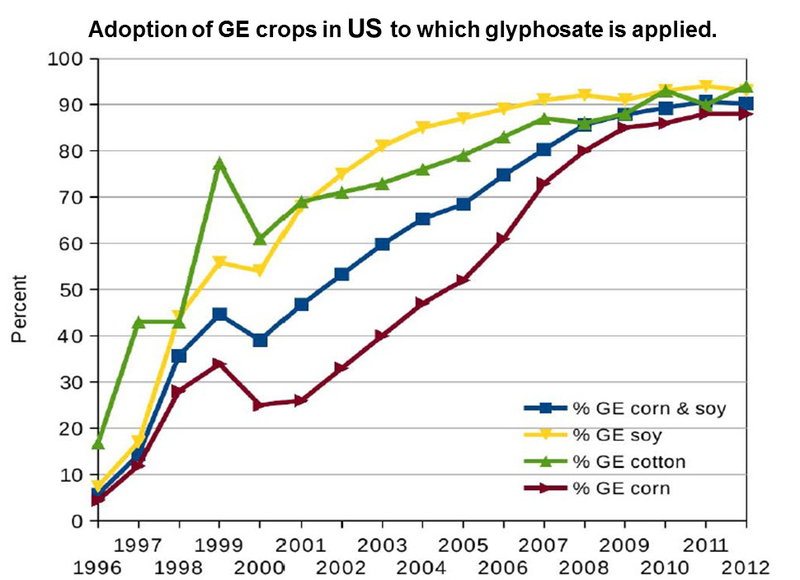 Use of the herbicide glyphosate has increased dramatically in recent years. Glyphosate is the primary (but by no means the only) ingredient in the herbicide RoundUp. Glyphosate kills plants including weeds, and it does this partly by acting as a mineral chelator that prevents the uptake of nutrients by plants. This starves the plant until it dies. However, plants genetically modified to withstand glyphosate still contain fewer nutrients and are therefore less nutritious. Moreover, any glyphosate you consume acts as a chelator in your body that blocks your uptake of minerals and nutrients. This will not be good, especially if the GMO foods you consume are already nutrient deficient. Glyphosate also interferes with how you uptake and process nutrients (like manganese) in ways that guarantee depletion in the body, as will be discussed further below). A major reason for increasingly larger applications of glyphosate on crops is the rise of glyphosate-resistant “super weeds.” This was not predicted to happen, but clearly it is happening. 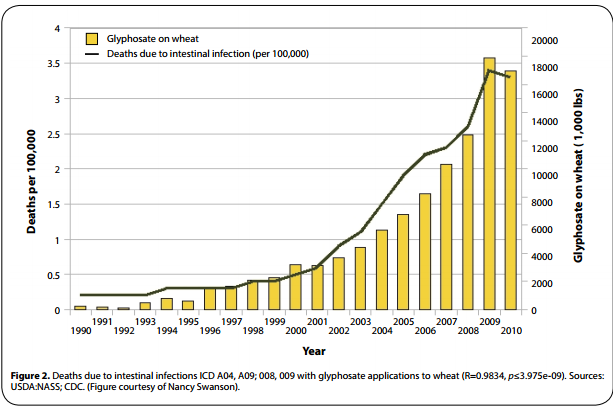 Thus, the “solution” to the development of super weeds has been simply to apply more glyphosate. This means greater amounts of poison in crops, and of course, greater profits for the herbicide company. The problem is that glyphosate is extremely toxic. If there were a perfect storm scenario for herbicide use, then glyphosate would be one component of it. Many scientists are concerned about it, including former genetic engineers like Thierry Vrain, who now advocates growing and consuming organic foods (see more below). Increased use of glyphosate will in turn accelerate the rise of super-resistant weeds, and accelerate damage to the health of those who consume it. Not to mention the unknown health risks of the genetically modified (GMO) crops themselves, which are sprayed with glyphosate. How would you be able to tell which is more damaging to health, the toxins embedded in GMO crops or the sprays that soak both GMO and non-GMO crops alike. None have been properly tested, or test results are hidden or suppressed. Beyond all this, non-GMO crops like wheat, oats, barley, beans, and nuts are routinely sprayed with glyphosate at the end of the season as a means to dry these crops to make harvesting easier. So much for trying to eat verified non-GMO. You’re likely getting a lot of glyphosate in your diet…unless you eat 100% organically grown foods that are not contaminated with glyphosate by direct spraying, spraying for the purposes of drying, or from drift related to nearby spraying. And with increased levels of spraying to apply more of this herbicide, the likelihood is you’re getting glyphosate not only from foods, but also from a contaminated water supply (wells, rivers, streams), and from rainfall (with more than 65% of rain samples testing positive). A noteworthy article on the topic of glyphosate and genetically modified organisms (GMO) is N.L. Swanson’s “Genetically Modified Organisms and the Deterioration of Health in the United States” (2013). This was originally published as a series of articles on the Seattle Examiner website. Scientists may disagree on the level of veracity of the article, and quibble over the finer points of statistical correlation. Meanwhile, people are getting sicker, not healthier. And that is the point. If indeed glyphosate is impacting human health adversely at even a fraction of the levels argued by Swanson, then individuals should reduce their consumption of GMO foods as much as possible to avoid health consequences. Foods containing GMOs should be clearly labeled, like they are in many other countries. Consumers have a right to know if foods contain GMO. There is no valid objection to labeling since many other (and far less harmful) ingredients in foods are labeled. This is a transparency issue. It is the least consumers deserve. In July 2016, the US enacted the so-called DARK Act, which requires labels for GMO products. However, this law is far weaker than the Vermont law that preceded it. The US law preempts state laws. It represents a poor attempt to address consumers’ desire for labeling of GMO foods. It offers no standard labeling requirements, nor any means to enforce compliance for companies that fail to label. And while some may consider the US law progress for consumers, consider that in Europe GMO labeling went into effect back in 1997 – nearly 20 years ago. In addition, proper scientific testing of the health effects of GMOs and in particular the herbicide glyphosate, as well as the adjuvants and surfactants contained in glyphosate-containing products—and how these ingredients act synergistically—must be carried out. Consumers should never be guinea pigs when science is available that can protect them and help them make informed decisions. Not unlike tobacco companies that suppressed and downplayed the harm of their products, today’s purveyors of agricultural chemicals (and especially GMOs and glyphosate) are not particularly concerned about the adverse health effects of their products. In fact, it appears to be just the opposite, as studies indicating harmful effects frequently have been suppressed. Several of the studies used to indicate safety of GMOs were short-term studies (three months) conducted by companies who make and sell the products themselves without peer review or release of data. Whereas longer-term, independent studies indicate probable harm to health, therefore showing the precautionary principle was disregarded in approving GMOs for human consumption. In order for consumer to protect themselves, GMO labeling is a minimum measure. Most nations already require clear labeling or ban GMOs. The use of antibiotics in livestock results in a tainted food supply. This means that foods ingested contain antibiotics that damage and destroy beneficial microbes in the human gut. This contributes to reduced microbiome diversity and paves the way for a takeover by harmful bacteria. Then there is the overuse of antibiotics in human medicine. The use of antibiotics significantly damages microbiome health and diversity. The importance of the microbiome for human health is such that antibiotic use that kills beneficial bacteria and imbalances the gut flora is proven to reduce overall health and can contribute to major health problems throughout life. This is especially true when antibiotics are used in childhood when the microbiome is establishing itself. Glyphosate is not considered an antibiotic per se, but it exerts antibiotic-like effects. That is, glyphosate destroys microbes by acting on the Shikimate pathway, and therefore acts like an antibiotic. This pathway is not present in human beings, but is present in plants and most microbes important for the health of the human gut. Glyphosate interferes with the synthesis by gut bacteria of aromatic amino acids (including tyrosine and tryptophan) as well as methionine. This leads to shortages in critical neurotransmitters such as serotonin and melatonin as well as folate. There is evidence to show that glyphosate produces resistance to antibiotic drugs, just as overuse of antibiotics themselves contributes to the increase of so-called “superbugs,” or bacteria resistant to most or all antibiotics. This fact is another reason glyphosate contributes to the health problems relating to antibiotic use and to gut health issues, in particular. The overuse of antibiotics both in humans and animals is an ongoing problem with many authorities calling for a reduction in use so that antibiotics are not rendered useless by the development of antibiotic-resistant strains of bacteria. Current policies regarding antibiotics virtually guarantee that not only will microbiome health be harmed by the consumption of antibiotic tainted foods and by the use of antibiotics too easily prescribed, but also that harmful bacteria will become stronger rendering antibiotics less useful in applications where they are truly needed. An interesting fact in this regard is that Pseudomonas aeruginosa, a gram-negative bacteria, is a major problem in hospitals today due to its resistance to multiple antibiotics. It is one of only three bacterial species that can break down glyphosate. However, it produces formaldehyde as a by-product. 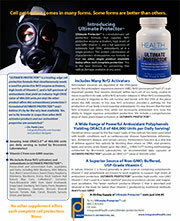 Formaldehyde is a well-established neurotoxin. It is likely that the growth of this harmful bacteria is stimulated by the presence of glyphosate in the gut. Avoidance of antibiotics in foods and when not medically necessary are ways individuals can help keep themselves healthy. While this article deals primarily with the topic of gut or gastrointestinal health, it is noteworthy that glyphosate is considered to be an endocrine disruptor. Endocrine disruption is associated with birth defects, reproductive problems (like infertility), breast cancer, and developmental problems in babies and children before and after birth, as well as a host of other health effects. Endocrine disruptors are common in the environment, and we have written about them in previous posts. Glyphosate’s role as an endocrine disruptor is important not only because it is another harmful element among its many dangers, but also simply because of its ubiquitousness in the environment. The amount of glyphosate spray in the US and the world in extraordinary. As weeds have become resistant to glyphosate (leading to the rise of super weeds), the solution has been to spray more of it. Therefore, the amounts to which individuals are exposed have skyrocketed along with the increase in its application on crops and elsewhere. Also, as noted, the practice of spraying glyphosate as a desiccating agent on non-GMO crops (such as wheat, oats, sugar cane, and peanuts) contributes significantly to human exposure. So too does “household” use in gardens and use by municipalities for spraying to decrease “weeds” in public places, such as parks and schools. Folate, Vitamin K, Vitamin A, Vitamin D, and cobalamin (Vitamin B12). Clearly it would be wise to take in foods and nutritional supplements that could replete the body with these substances. Another class of worrisome genetically modified crops are Bt corn and other Bt crops (cotton, potato, and soy). Note that there are also glyphosate tolerant/resistant strains of corn (maize), so all types of GMO corn are potentially hazardous to health. Bt corn is a variant of maize genetically altered to express proteins from the bacterium Bacillus thuringiensis. Thousands of different Bt strains exist that produce proteins toxic to insect pests. Particular strains are chosen to target specific plant pests, such at the European Corn Borer (ECB). When an insect consumes Bt-containing plant tissues, one or more Bt proteins become activated in its gut, creating toxins that paralyze its digestive system and form holes in its gut wall. Bt toxins bind to receptors in the insect’s gut. This causes the gut wall to break down and allows toxins, as well as normal gut bacteria to enter the insect’s body. Toxins and bacteria proliferate in the insect’s body causing death. Notably, many insects have developed resistance to glyphosate, just as have weeds. It has been noted by commentators that the human digestive system appears to be damaged in a similar way by proteins in Bt corn. 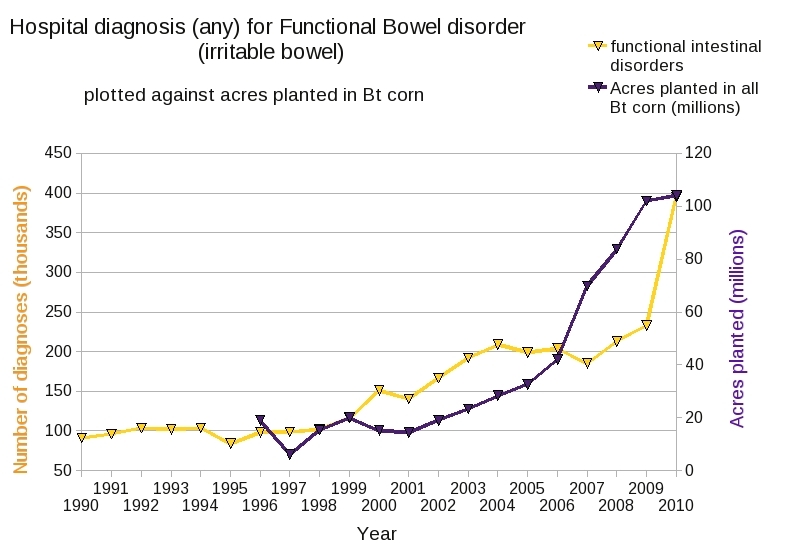 In any event, as the number of acres planted with Bt corn increases, it appears that human digestive disorders also increase. Disorders of the digestive system associated with Bt toxins not only include irritable bowel syndrome (IBS) and constipation, but also Crohn’s Disease and Ulcerative Colitis. While the effects of the Bt toxin are different than those of glyphosate and other chemicals in glyphosate-containing crop chemicals, the fact is that evidence shows that the Bt toxins appear to adversely impact gut health. Among key takeaways from examining the literature of problems associated with antibiotic use, as well as with the chemicals associated with modern agriculture and genetically modified foods (i.e., glyphosate and other herbicides, pesticides, and various surfactants and adjuvants used with them): Choose to eat organic foods as much as possible for best health. Only by consuming organic foods can individually significantly reduce the amount of glyphosate, pesticides, antibiotics, and other harmful chemicals in the diet to support good health in general, and gut health in particular. Organic foods are also more nutrient dense, and therefore more nutritious. After it is understood how current industrial agricultural methods contribute to damaging human health, then organic foods can be seen as a solution helping ensure avoidance of most or many of harmful elements in foods. Organically grown foods may be tainted by drift or by toxins in the soil existing before the adoption of organic farming methods. Yet, the amounts of such toxins will be significantly reduced overall by consuming organic foods. The longer-term solution is adoption of organic methods (and corresponding reductions in use of chemicals and GMOs in agriculture) that will result in a cleaner, safer food supply for all. Some say that organic foods are no better, or cost too much, or do not improve health. But the truth is that they are better, should not cost more, and are far more sustainable for human and planetary health. In fact, at this point in time, consuming organic foods may be the only practical solution for avoiding health problems, especially gut-health problems, associated with industrialized, chemically based agricultural methods. Growing food yourself is another option, as is purchasing organic or locally grown organically grown produce at your Farmer’s Market. These foods will not be sprayed with toxins and will not suffer the same level of nutrient declines found in conventional produce. Having even a relatively small garden at home will allow you to supplement organic foods you obtain locally. Some neighborhoods support community gardens where you can grow foods organically. Between consuming foods you grow, purchasing organic or non-sprayed produce locally and/or at natural foods stores, emphasizing grass-fed, free-range animal products (e.g., eggs and meats), and reducing meals at restaurants that serve conventional foods (as well as ordering organic and non-GMO foods whenever possible), you can largely bypass or reduce the toxicity and gut-health issues associated with the toxins and GMOs in foods sold in grocery stores and ubiquitous in our food distribution system. A 100% organic diet is recommend, entirely possible, and at the very least a worthy goal. It will pay dividends in terms of good health and how you feel. Others recommend to detoxify from glyphosate by consuming an organic diet. Wheat stands out as a singular food to avoid. It been hybridized beyond all recognition with many genes being added because wheat genes are additive. The wheat protein gluten has been linked to many types of health problems. Gluten has long been a problem for gut health. Now with glyphosate being sprayed directly on wheat crops (as well as oats, sugar cane, and peanuts) as a desiccating agent, it seems that opening tight junctions in the gut and then having exposure to gluten is a prescription for disaster. Glyphosate increasingly is sprayed on wheat (a non-GMO crop) for drying before harvest. How does poisoning wheat this way make sense? Some commentators (like Wheat Belly author William Davis, MD) show that gluten is linked with obesity, diabetes, celiac disease, and many others. Avoidance of wheat, gluten, and other simple carbohydrates is a good idea if you would maintain and retain good gut health. 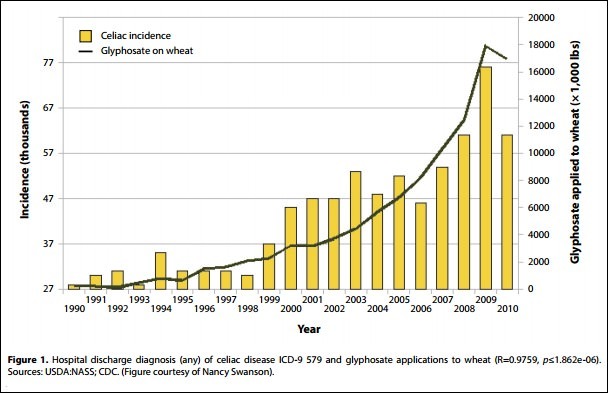 Celiac disease has significantly increased with the practice of spraying glyphosate on wheat. Industrial agriculture, including the practices associated with the cultivation of GMO crops, harms the soils and human health. Dangers to human health from industrial agriculture and GMOs includes harm to gastrointestinal health. This encompasses many conditions, including Leaky Gut Syndrome. Leaky gut does not always result from a single cause, but can involve multiple factors, including exposure to glyphosate (and its adjuvants), Bt toxins, depleted nutrient levels, wheat and wheat protein (gluten/gliadin) exposure, microbiome imbalances or disruption, antibiotic use or consuming foods containing antibiotics, other chemical exposures, and additional factors. Ways to avoid leaky gut: 1) Consume a 100% organic diet, 2) Avoid GMOs, 3) Avoid antibiotics, 4) Maintain a healthy microbiome, 5) Avoid wheat and simple carbohydrates (and simple sugars), 6) Improve nutrient levels through diet and dietary supplements, 7) Use specific supplements that help restore and maintain gut health 7) Detoxify on a regular basis using juices, herbs, and other practices. We will continue writing articles for blog series on the topic of gut health. In coming months, we will write about various means for improving gastrointestinal structure and function. These means include restoring tight junctions in the gut using Restore (lignite formula).